당간지주는 사찰 입구에 세워두는 것으로, 절에서는 행사나 의식이 있을 때 당이라는 깃발을 달아두는데, 깃발을 걸어두는 길쭉한 장대를 당간이라 하며, 당간을 양쪽에서 지탱해 주는 두 돌기둥을 당간지주라 한다. 이 당간지주는 지금은 세검정초등학교가 들어서 있는 장의사의 옛터에 동서로 마주 서 있다. 장의사는 백제와의 싸움으로 황산(지금의 논산으로 추정)에서 전사한 신라의 장수 장춘랑과 파랑(罷郞)의 명복을 빌기 위해 신라 무열왕 6년(659)에 세웠다고 전한다. 이 당간지주는 마주 보는 기둥의 바깥면 두 모서리를 죽여 약간의 장식을 보이고, 기둥머리는 안쪽 면에서부터 바깥쪽으로 약간 평평하다가 이내 원을 그리며 깎여져 있다. 당간을 단단히 고정시키기 위해 안쪽 면 윗부분 가까이에 둥근 구멍을 뚫어 놓았다. 대개의 경우 당간을 꽂기 위한 장치를 하더라도 기둥머리에 따로 홈을 내는 것이 보통인데, 여기에서는 그 유례를 따르지 않고 있어 흥미롭다. 전체적으로 높이에 비하여 중후한 편이며, 별다른 장식이 가해지지 않은 매우 소박한 모습이다. 세워진 시기는 확실히 알 수 없으나, 망덕사터의 당간지주와 비교하여 볼 때 통일신라시대의 작품으로 추측된다. These two props for a flag pole face each other in an ancient Buddhist temple called the Janguisa Temple. 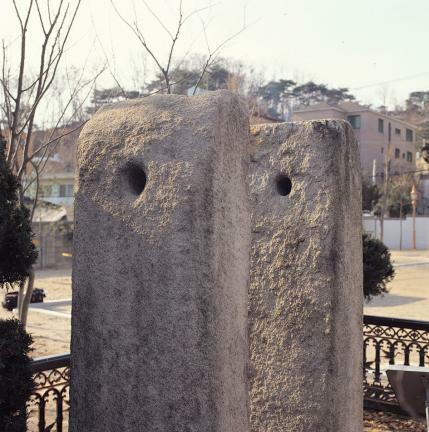 Designed to use for putting up flags during religious ceremonies, the danggan, or flag pole, is supported by a pair of stone props known as dangganjiju. 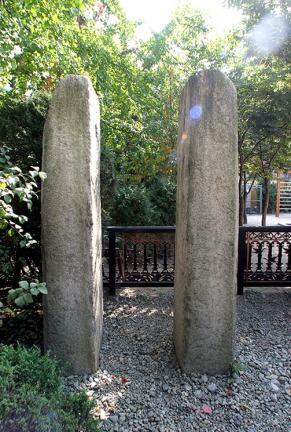 The Jangeuisa Temple is said to have been built in 659, 6th year of the reign of King Muyeol of Silla. Later, an elementary school took up the site and these banner pole support stand in the school yard. The stone props, scarcely decorated, have holes for fastening the flag pole. 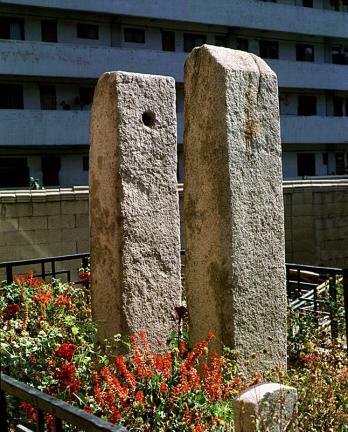 In most flag poles, the holes in the two supporting stones go all the way through. But this pole is somewhat unusual as only one of the supporting stones is pierced all the way through. As a whole, these banner pole props still maintain grandeur although simple with no special decoration. 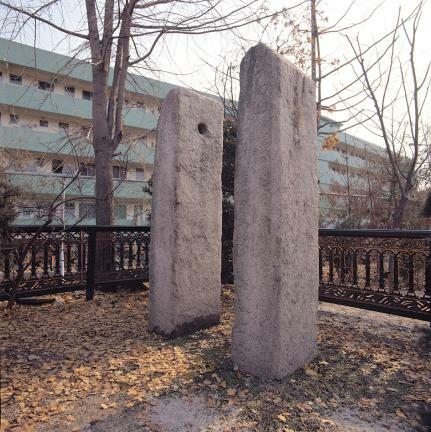 No records were found to show exactly when these were built, but historians believe that they are the works of the Unified Silla since they can be compared with those located in the Mangdeoksa Temple site.